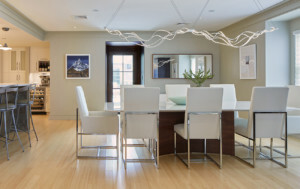 Sculptural forms define space here in unexpected ways, from the industrial pendant kitchen lights, to the delicate glass artwork on the far wall, to the cascading chandelier glimpsed in the living room. To pass under Memorial Bridge, captains of tankers and tugs, sailboats and fishing boats must navigate the river’s notoriously swift current. Pedestrians stop to gaze at the boats, and then stroll down to the park or scurry to work. It is a vibrant, seaport scene—and the Daigles’ condominium gives them a front and center view of it. As their new home was nearing completion, Susan Daigle recalls it as a wide-open space. Essentially, it was a blank canvas. 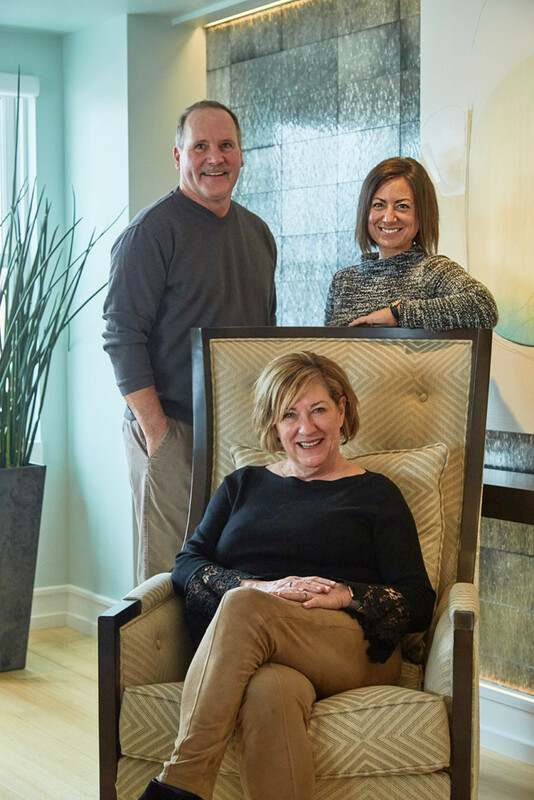 The design team included Eric Bessemer, builder and cabinet maker based in Greenland; Susan Daigle, homeowner (seated); and Frances Hodges, interior designer in Newmarket. Working with architect Jen Ramsey, of SOMMA in Portsmouth, and the building team, Hodges was able to create a completely custom home. As Hodges and Susan talked more and developed a vision board together, some themes emerged: water, the coast and, in particular, waves. 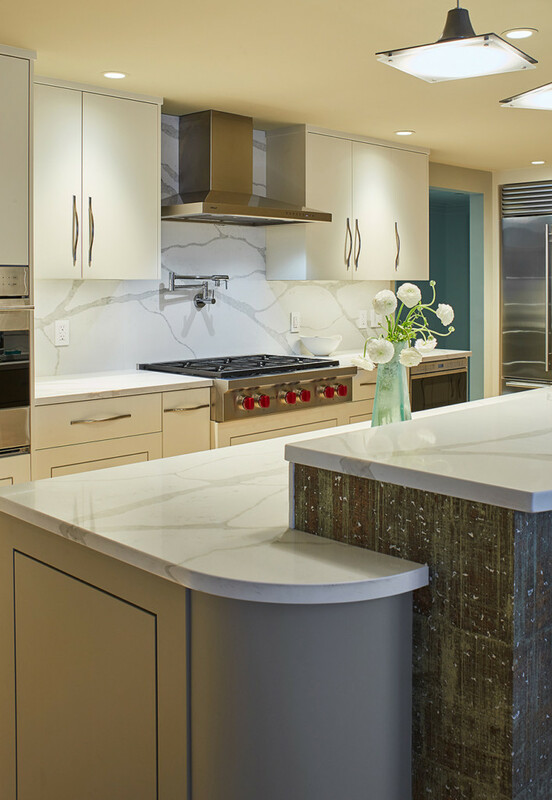 Bessemer crafted sleek custom kitchen cabinets and the island. 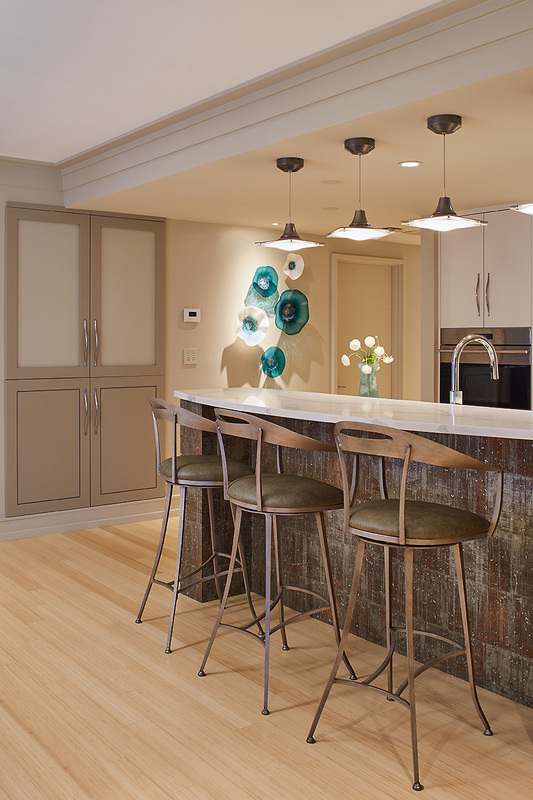 Subtle curves define the space in a graceful and welcoming way: the island’s countertop edge and its rounded corner, the metal barstools’ sinewy curved backs. 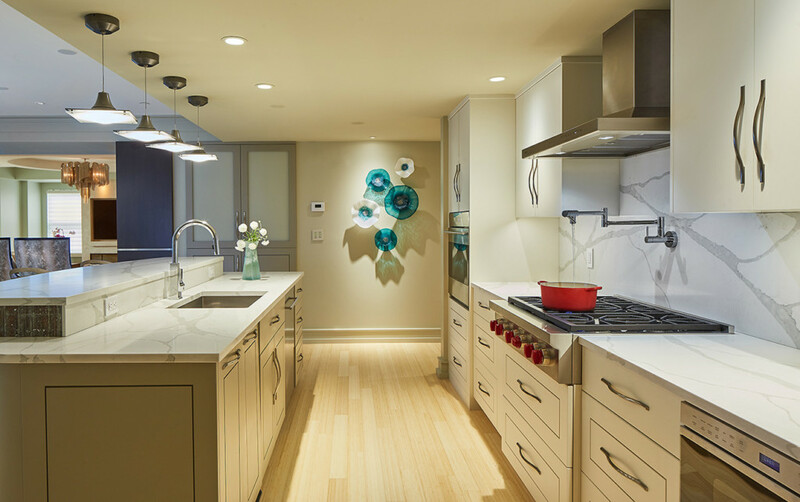 Even the cabinetry’s hardware has a gentle curve, emphasizing that wave theme. Hodges, who loves to shop locally, purchased the barstools from Cabot House in Portsmouth. The kitchen appliances are located within a convenient triangle. These include: a Wolf stovetop and wall hood; Wolf ovens—dual convection, convection steam and drawer microwave; a Sub-Zero refrigerator/freezer and wine cooler; and an Asko dishwasher. On the wall opposite the refrigerator, Bessemer neatly installed a capacious food pantry with cocoa-colored double-doors. On the dining table is a simple, handcrafted blue bowl that centers the whole room. Hodges looks for just the right objects and art, and almost invariably, finds them in Portsmouth. The bowl came from Nahcotta, a Portsmouth gallery. “The owner, Deb Thompson, lets me explore their stock that hasn’t yet been displayed to look for pieces,” Hodges says. “I love connecting my clients with local artists. This is such a great environment for creativity, and the work of local artists is deeply inspiring.” Hodges gets everything framed at Kennedy’s Gallery and Custom Framing in Portsmouth. Simplicity makes “small” touches stand out—the rounded end of the kitchen island, the silvery flecks in the cork that wraps one side of it and the curved hardware on the cabinets. Gazing from the dining area into the living room, the passageway is framed in black walnut. A slender, silver band embedded in the walnut—like a horizon line—leads the eye into the next room to a softer, more intimate space. Working with Hodges, Bessemer built this entryway and the living room’s coffered ceiling, which creates shadows and depth. In that room a rectangular fireplace burns brightly; and soft, white, textured couches and generous armchairs look inviting. The living room furniture was purchased at JRenee Design Center in Rye and was entirely customized for the Daigles, work that included upholstery and wood finishes. A stunning, central chandelier provides a shimmering focal point. Bessemer crafted the floating shelf in front of the glass wall. 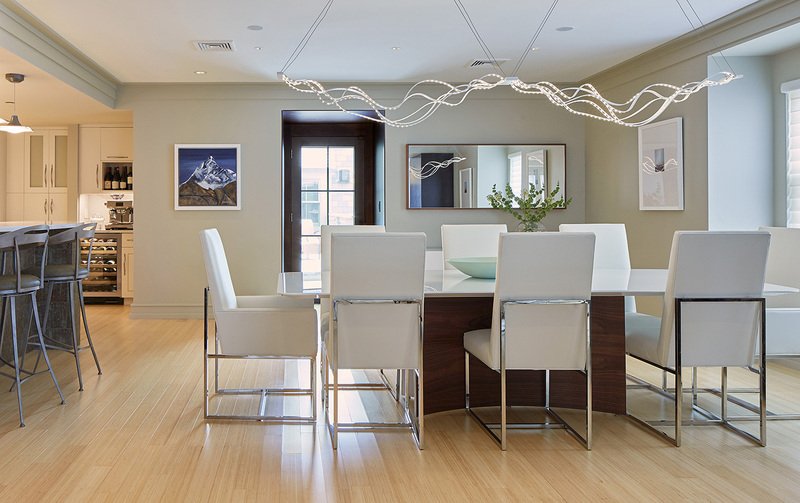 What was once just a wide-open space has been transformed with light, color, texture and sculptural forms—frame by frame—into the beautiful, modern home the Daigles envisioned. When it’s warm outside, the Daigles like to sit out on their deck to enjoy the play of light and their lively neighborhood. 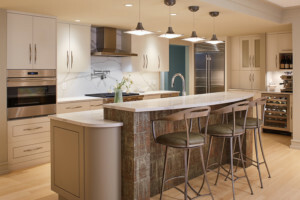 You can see the Daigles’ kitchen in person by taking The Music Hall’s Twenty-Eighth Annual Kitchen Tour on Saturday, May 11. A celebration of stunning views, sleek settings and cozy charmers, this year’s kitchen tour showcases state-of-the-art kitchens in both new and historic downtown Portsmouth homes. This Mother’s Day weekend event is like a home-renovation show come to life. All are invited to spend an inspiring day with family and friends exploring dream kitchens of all shapes and sizes in enviable and surprising locations. Plus, if you’re looking to turn your imaginings into reality, the craftsmen, artisans, designers, architects and builders involved in creating these spaces will be on-site to answer your questions. The tour runs from 10 a.m. to 4 p.m.; for more details and ticket prices, visit themusichall.org/events/28th-annual-kitchen-tour.